Always Drunk: Artist of the Day: Caravaggio, Baby! Artist of the Day: Caravaggio, Baby! 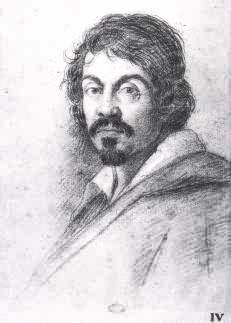 Today is the 440th birthday of one of my favorite artists, Michelangelo Merisi da Caravaggio. Looks like a badass, because he was. ﻿ Caravaggio created dozens of gorgeous paintings in the Baroque style between about 1592 and 1610. He specialized in insanely intense chiaroscuro effects; saturated colors; and emotionally charged, voluptuous figures. Basically, Caravaggio's paintings bespoke swagger and torment, because that's the kind of guy he was. When he wasn't painting, he was carousing and beating people up. He also killed a guy over a tennis match. He was only 38 when he died, and until recently no one really knew how. Turns out it was likely of an infected wound, but it was exacerbated by ridiculous levels of lead he absorbed through his paint, which probably made him crazy to boot. 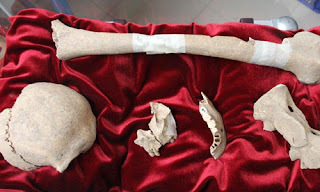 Here are some of his awesome, lead-saturated bones. ﻿One of my all-time favorite paintings is Caravaggio's The Cardsharps. 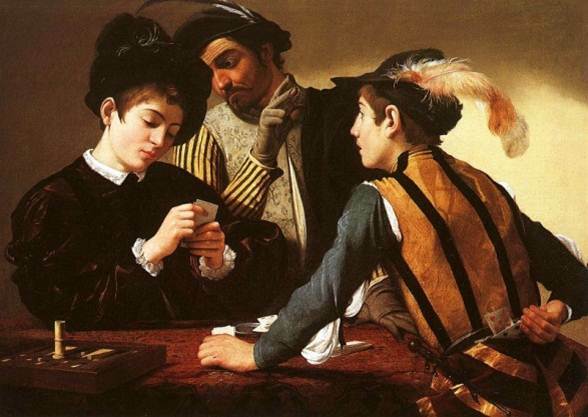 Narcissm alert: Caravaggio based the kid about to be fleeced on himself! ﻿﻿﻿﻿ And amazingly, this painting lives about an hour from me, at the magnificent Kimbell Art Museum in Fort Worth, Texas. I think one of the reasons I love The Cardsharps so much - apart from its masterful composition and breathtaking brushwork - is the fortunate way I was introduced to it. I was actually taking an art history class specializing in the Baroque period at the time the Kimbell acquired the painting. The instructor immediately assigned the class to go see it, so I grabbed my boyfriend (now known as my Beloved Spouse) and made my first-ever visit to the museum. The painting mesmerized me, especially since I could apply all my new art history learnin' to it. It's held a special place in my heart ever since. By the way, the Kimbell is hosting a major Caravaggio exhibit starting October 16. If you're in the neighborhood (and by neighborhood I mean the United States, because this is its only U.S. location), you should come down and check it out. See what a little swagger and a whole lot of lead can do for an artist's vision. You should see his stuff at the Villa Borghese in Rome. Also, the Vatican Pavilion at the 1984 N.O. World's Fair had a gorgeous painting by C. Happy Birthday indeed! Found you on the Curmudgeon, and i really enjoy your writing. Thanks, Bootsy! There are many reasons I'd love to get to Italy, including to feast on Caravaggio. If you have a few hundred thousand frequent flier miles you're not using, I'll head over to Rome right now!